Stuart Park in the northwest part of town near the airport consists of 37 acres and was added to the Park District in 1990. The land is leased from the A. Lincoln Capitol Authority. It is located north of the intersection of Route 97 and Veteran's Parkway along Winch Road. The park is surrounded by residential areas on the south and east and 2 residences along Winch Road are directly adjacent to the park. The site is rolling and drains toward the south. Farmland is to the north and west. A small pond is in the park's southwest corner. Stuart Park offers two completely fenced areas where dogs may be unleashed. The larger dog run is reserved for larger dogs and the smaller dog run is reserved for smaller dogs. 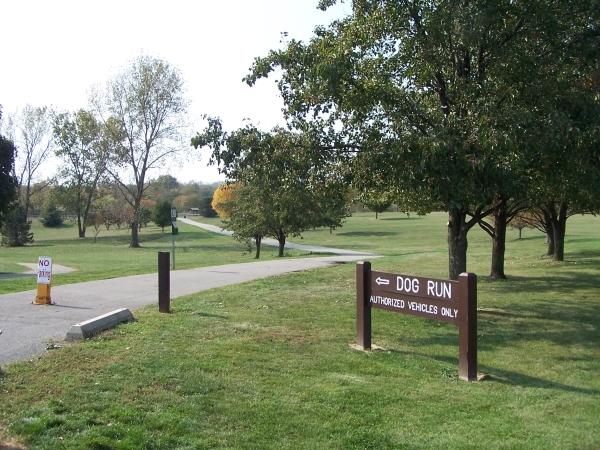 Each dog run includes a water source, dogiPot, and picnic shelter. For a complete list of amenities please see below. Large dog run is reserved for large dogs and small dog run is reserved for small dogs. Use at your own risk. Owners are responsible and liable for the actions and behavior of their dogs at all times. It is recommended that children be supervised by a parent or guardian. Users are limited to three dogs per visit. Dog owners must be in the park at all times. Dogs should remain leashed while walking between the parking lot and the dog runs. Dog owners must keep their leash in hand at all times. Dogs must be licensed and vaccinated. Proof of a current rabies vaccination and license required upon request of a police or animal control officer. Tags may serve as proof. Aggressive dogs are not allowed. If your dog becomes unruly or plays rough, leash it and leave immediately. Female dogs in heat and puppies under four months old are prohibited. Sick dogs and dogs with parasites (worms, fleas, or ticks) are prohibited. Failure to abide by the park rules may result in loss of privileges and owners may be ticketed up to $500. All other Park policies apply.